Over half of the women currently working in the culture and entertainment sector have experienced some form of sexual violence, a government investigation team on sexual violence in the culture and entertainment industry said Monday. The team recommended that the government create an organization specifically to deal with the issue. The special probe team, formed jointly by the Ministry of Culture, Sports and Tourism and the National Human Rights Commission, conducted a survey of 3,718 cultural figures as part of its ongoing investigation. Of the 2,478 female respondents, 1,429 said that they had been subjected to some form of sexual abuse, harassment or attack. Monday’s report capped off the 100 days of the team’s work after it kicked off on March 12, prompted by the worldwide #MeToo movement that encourages victims of sexual attacks to come forward and publicly denounce their attackers. The government team has also been running a center for the victims, through which 175 cases have been reported and 36 cases have been investigated. The statute of limitations had passed on nine cases. The team could not investigate 11 cases as their victims either did not want to come forward or did not want an investigation. The investigative team’s leader Cho Young-sun, secretary-general of the NHRC, said that this proves that many victims of sexual violence still find it difficult to come forward, given the society‘s prevailing sentiment on such crimes. “It shows that there is a solid ‘wall’ that women of our society feel. Also there were concerns over secondary damage,” Cho said, referring to possible repercussions the victims may suffer as a result of publicly reporting a sexual violence case. 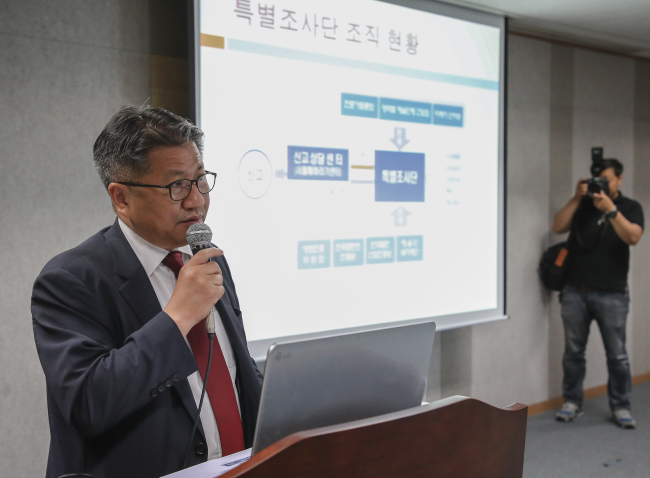 The focus of the preventive measures that the probe team recommended is to create a governmental organization that deals exclusively with the sexual violence within the culture and entertainment sector. It suggested that the organization should create a service for the victims that is modeled after the Sunflower Centers -- which give medical and therapeutic aid to victims of sexual or domestic violence -- and also be able to monitor the situation to prevent secondary damage on the victims. Other measures, such as providing legal grounds to ban the perpetrators of sexual violence from government support, obligating the employers to include anti-sexual harassment measures in the contracts, creating manuals on preventing sexual violence, and increasing on-site inspections on sexual violence were also suggested. The Culture Ministry said it will review the recommendations and take necessary actions, and will keep receiving reports of similar offenses from the victims. The NHRC said it will root out sexual violence in the culture sector by working with universities. The plans include stepping up protection of those who report such cases, increasing on-site inspections while holding classes to educate against sexual violence. The human rights commission said it will also monitor the sexual violence-related policies by the Ministry of Education and the Ministry of Gender Equality and Family for further improvements.